It has been a long few days in the Anderson household. After a great family hike and a short road ride for me on Saturday, Ian and I started to become a bit concerned about the noise Axel was making every breath he took. He had started this mysterious pigeon-like noise on and off since he was about 5 days old but it continued to get more consistent and concerning. By Saturday afternoon he was struggling for air and breathing very rapidly so the pediatrician was called. I like my time off from work so I struggled with the decision to bother the doctor on the weekend but with Ian concerned, I realized things might actually be serious (he doesn’t overreact like I do). After listening to Axel over the phone, Dr. David Brooks asked me to meet him at his office as soon as I could get there. Still thinking Axel was just a noisy, happy kid I didn’t think much of it. The doctor listened to Axel’s lungs and throat, looked in his nose and mouth and said ‘yeah, he makes a funny noise’. He explained to me that some kids are born with ‘floppy tissue’ in their airway causing it to collapse on itself when they breathe and creating an audible noise. With that we were admitted to the nursery for the night for evaluation. The nurses had specific orders not to give him oxygen or to intervene unless it was bad in order to determine what was happening at home. And just after being there for a few hours, his oxygen saturation dropped often and low enough for him to be put on oxygen. After an upper GI test on Sunday morning that determined it wasn’t a tumor, it was decided the best and safest thing for Axel was to spend another night in the hospital and then to speak with the pediatric ear, nose and throat doctor in Denver on Monday. 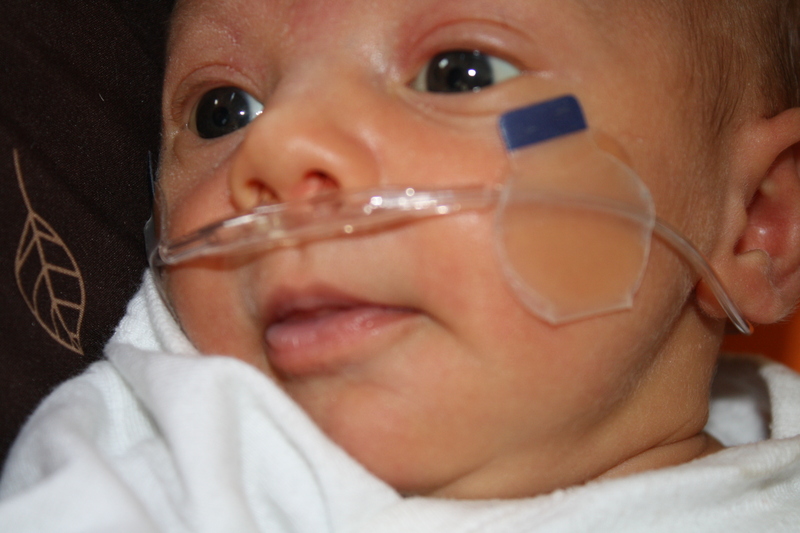 It was strange for me to be back in the birthing center with all the newborns and to have another child in the NICU. Thankfully the nurses and the staff at the birthing center are amazing and genuinely caring and helped me get through the mental aspects of spendng two nights in the hospital with my 2-1/2 week old. Axel was finally released from the hospital on Monday afternoon and was sent home on oxygen. Dr. David was able to make an appointment with the specialist at Denver Children’s Hospital for Tuesday morning in order to have a scope of Axel’s airway completed. Dr. Friedman scoped Axel while I held him on my lap and it was clear that his airway is collapsing with every breath and he was officially diagnosed with Laryngomalacia. At this point, Axel is gaining weight well which means we can wait and see if he will naturally outgrow the condition. The catch…he will potentially be on oxygen for up to a year or longer. We will continue to do weight checks and reevaluate the situation to see if he can come off the oxygen or if he will require surgery. Normally in difficult situations I enjoy a long run or ride to help clear my mind but that has not been possible as I needed to be with Axel throughout all this. Even if I had had a chance to get out for a bit, I don’t think I would have been able to leave the little champ alone and Ian was taking care of Juniper. As much as I miss training, especially now that my new Chariot Cheetah has arrived, I know I’ll be able to get back to it when the time is right. Now I need to focus on my little man and making sure his big sister gets some attention as well. sari – good thoughts coming your way! sure axel will move thru this in no time. nice new chariot! Sorry to hear that you’re dealing with all of this. Stay strong and positive. He’ll be a little fighter just like Mama. Prayers headed your way.